Another view from Ginza 4-chome looking towards Kyobashi. The high elevation affords a clear view over Tokyo. 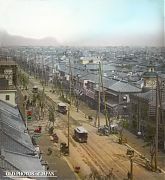 Ginza’s celebrated willow trees are still very small on this image, but there are already horse-drawn streetcars. These started operations on June 25, 1882 (Meiji 15). That suggests that this photo was taken during the early 1880s.